A-HOTEL.com - Halpa ja Hotellihuoneen Irugūr, Intia. Majoituksen varaus Irugūr ja ympäröivä. Tätä ohjeellista tarjous on peräisin viimeksi varattu majoitus Irugūr ja lajitellaan alimmasta hinnasta. Voit valita majoitus mieleisesi suosittelemme valita yhteensä 1 tarjoaa majoitusta Irugūr. Syöttämällä haluamanne päivämäärät Irugūr ja käyttäen suodatin työkaluja voit lajitella parhaan mahdollisen majoituksen sinulle.Tuli haluamanne päivämäärät ovat ratkaisevia tarkin tarjouksen, koska se saa kaikki verkossa tietoa hinnoittelusta ja majoituksen saatavuus. Sitten voit varata valitun Irugūr majoitus (hotellit, jne.) heti. Featuring a shared lounge and a restaurant, The Acacia Hotel is situated in Irugūr. With free WiFi, this 3-star inn offers a 24-hour front desk. OYO 15702 Thulsi Residency is a 3-star property situated in Coimbatore. Located around 10 km from Codissia Trade Fair Complex, the hotel with free WiFi is also 8 km away from Fun Republic Mall. Located within 9 km of Codissia Trade Fair Complex and 7 km of Fun Republic Mall, OYO 13858 Rithus Residency provides rooms with air conditioning and a private bathroom in Coimbatore. 7 km from Coimbatore Medical College, the property is also 11 km away from Brookefields Mall. 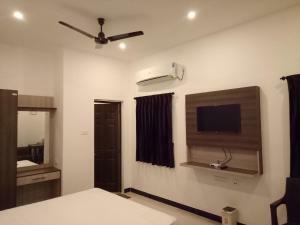 Located 9 km from Codissia Trade Fair Complex in Coimbatore, Homestay with homely comforts in Coimbatore, by GuestHouser 39295 offers accommodation with a kitchen. This property is 7 km from Fun Republic Mall. 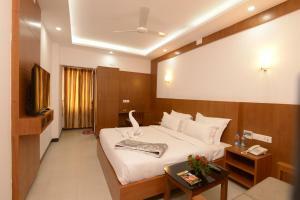 OYO 18452 Flagship Pritam Airport Inn is set in Coimbatore, 2.7 km from Codissia Trade Fair Complex and 2. Offering a restaurant, The Arcadia is located in Coimbatore. Free Wi-Fi access is available. Located 650 meters from Coimbatore International Airport, Fairfield by Marriott Coimbatore is situated in Coimbatore and offers rooms with free WiFi. The property is 2. Set in Coimbatore, 4.1 km from Codissia Trade Fair Complex, Hotel Gowtham provides a bar and rooms with free WiFi access. Offering free WiFi, Sri Murugan Residency is located in Coimbatore. Featuring a 24-hour front desk, this property also provides guests with a restaurant. Conveniently located on Airport Road, Skylite Hotel is just 100 metres from Coimbatore Airport and 800 metres from the City Centre Market. Free wired internet is available at the hotel's public areas. Boasting a terrace and a shared lounge, Hotel Chenthur Park is situated in Coimbatore. This 4-star hotel offers a 24-hour front desk. Situated within 2.3 km of Codissia Trade Fair Complex and 1. Aishvarya Residency Coimbatore is located 1 km from Avinashi Road and 1.4 km from KMCH Hospital. Offering an outdoor swimming pool, a fitness centre and a spa and wellness centre, Jenny Residency Club is located in Coimbatore. Guests can enjoy a pampering massage at the massage parlour. Set in Coimbatore, OYO 18954 Varun Residency is 2.1 km from Codissia Trade Fair Complex. ComfortWings is located in Coimbatore, just 1.9 km from Codissia Trade Fair Complex. Gokulam Park Coimbatore is located 4 km from Coimbatore International Airport and 6 km from the CODISSIA Trade Centre. It offers a restaurant, free parking and free WiFi access. Offering a restaurant that serve local and Chinese cuisine, Hotel Royal Chambers is located just 1.5 km from the Coimbatore International Airport. Located within a 4.5 km radius of Coimbatore Airport and Codissia trade Centre with free Wi-Fi access, Aloft Coimbatore Singanallur offers an outdoor pool and a gym. Less than 1 km from Codissia Trade Fair Complex, OYO 23426 Jr Guest Home is situated in Coimbatore and provides air-conditioned rooms. Located around 3.